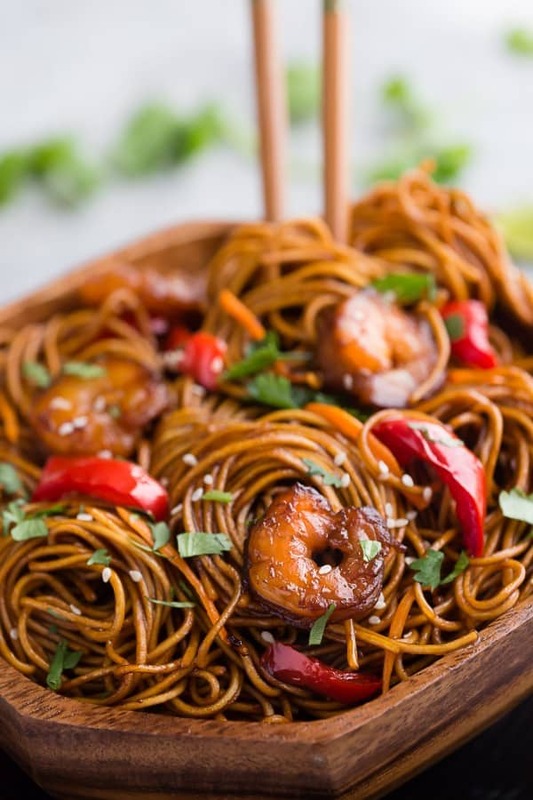 Shrimp Stir-Fry Lo Mein Noodles – an easy weeknight meal made with shrimp, shredded carrots, red bell peppers and an authentic, flavorful sauce. Ditch the takeout, this is so much better! UPDATED: With new photos May 2016 from original January 2014 post. During Chinese New Year / Lunar New Year, noodles are a must since they symbolize long life. 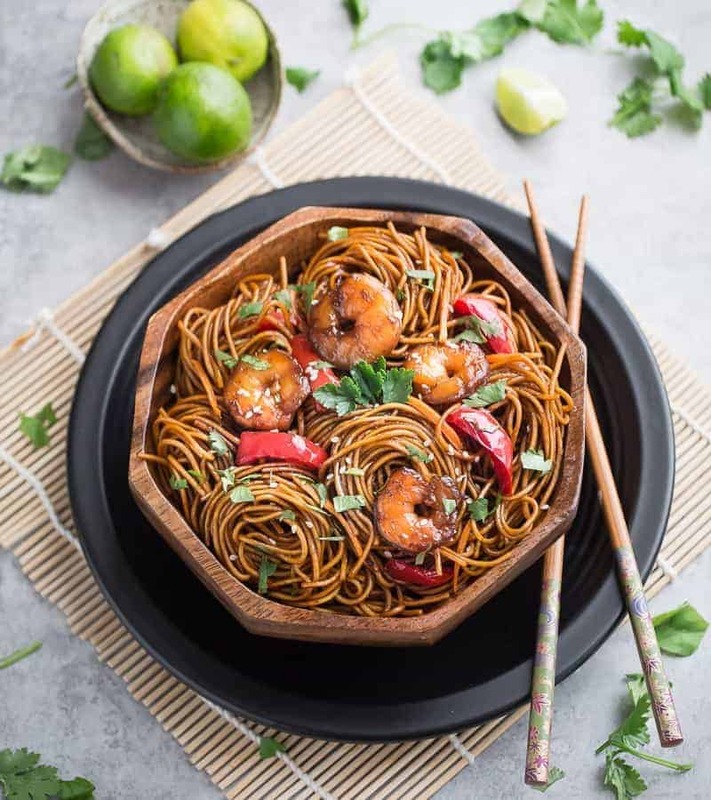 These Shrimp Stir-Fry Lo Mein Noodles are one of the traditional dishes that my family always has on our feasting table. Not only are the long noodles auspicious, but the shrimp symbolizes happiness because in Chinese shrimp is pronounced “haa” and that sounds like laughter. 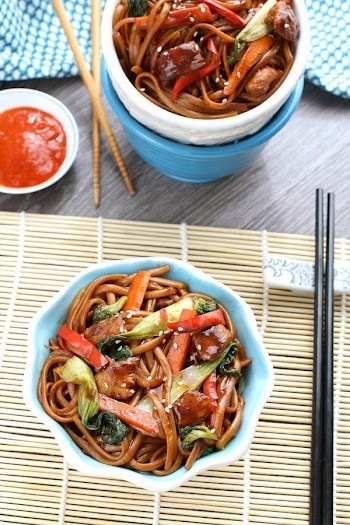 This colorful lo mein noodle dish is seriously a lazy cooks dream! It comes together so fast and effortlessly which makes it perfect for busy weeknights, when we all just need a quick and tasty meal! Plus, you gotta love how easy noodles are to customize with whatever you have on hand. We used bell peppers and shredded carrots this time but they work well with pretty much whatever veggies you have lying around in your fridge. 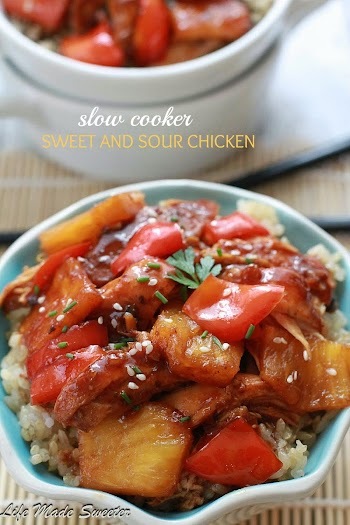 So bright, flavorful and much easier than picking up takeout! 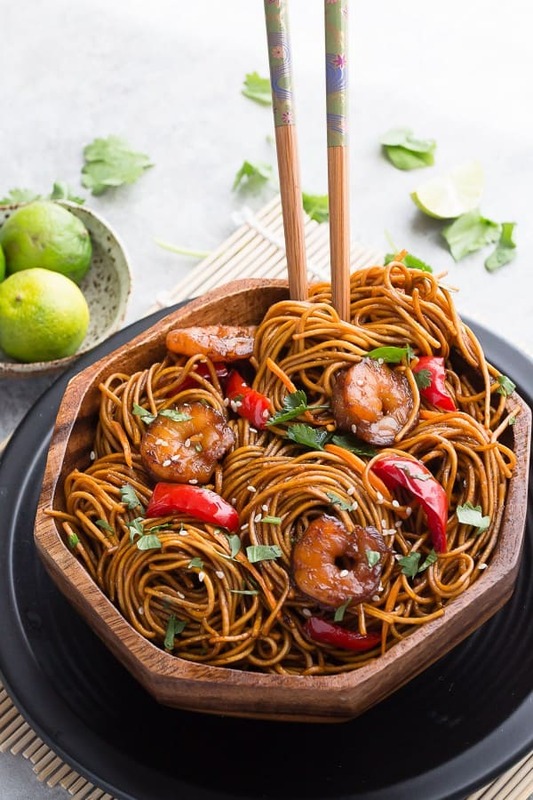 Shrimp Stir-Fry Lo Mein Noodles – an easy weeknight meal made with shrimp, shredded carrots, red bell peppers and an authentic, flavorful sauce. 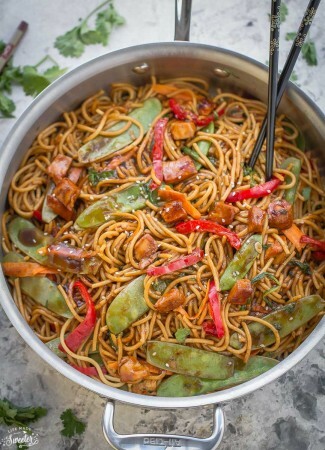 If using fresh lo mein noodles, remove from package and separate loosely in a large bowl. If using dried pasta, cook noodles according to package directions, drain well and set aside. In a large skillet, heat oil over medium-high heat. Add shrimp and sear on both sides until slightly pink and almost cooked through (about 2-3 minutes). Add garlic and saute for 30 seconds, or until fragrant then add carrots and bell peppers and stir until slightly softened, about 3 to 5 minutes. Add prepared noodles and sauce; toss and cook until hot and evenly mixed, about 2 minutes more. Remove from heat and serve with toasted sesame seeds and chopped cilantro if desired. Looking for more take-out favorites?